1. Amount of yarn will depend on how large you make your afghan. This one took 32 ounces. 2. 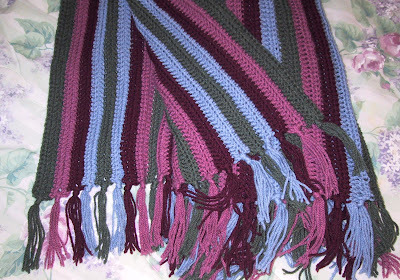 Afghan in photo was crocheted with two rows of each color. It looks nice worked with only one row of each color. 3. Rather than count stitches, just make a long chain and when you crochet the first row, crochet as far as you like for the length of your afghan. Cut off remaining chains. 4. When starting and ending rows leave an 8 inch tail to be included in fringe. Leaving an 8 inch tail, chain 211 stitches for foundation. This will be about 60 inches. Want your afghan longer? Start with a longer chain. Row 1: Hdc in third stitch from hook and in each remaining chain. If changing colors fasten off. Remember to leave an 8 inch tail. Row 2 and all remaining rows: Turn. Join new color, if needed, with a slipstitch. Ch 2, hdc in blo (back loop only) of each hdc, being sure to go into first stitch. Change colors as you like. Making afghan the width you want. To finish, work a row of slip stitches in last row. This stabilizes the edge and makes it resemble the beginning edge. To cut yarn pieces for fringe, wrap around a book or other object about 8 inches in height. Cut on one edge so that you have umpteen pieces of yarn about 16 inches long. Fold three pieces of fringe in half. Using your crochet hook, pull the loop through between hdc on end of afghan. If that space has a yarn tail, pull the tail and the ends of the fringe pieces through the loop. Tighten up and repeat across in every hdc on both ends of afghan. Tie an overhand knot close to the knot formed by pulling the ends thorough the loop. When your fringe is complete, lay the afghan flat and smooth out the fringe. Using a piece of cardboard as a guide, trim the fringe evenly. Well what's not to love about that gorgeous easy (hooray) blanket! Thanks Kathy. I needed some love this morning. A friend taught me to Crochet about 4 years ago. Some of the Crochet patterns are too advanced for me, but since finding your site I've gotton back into it. God Bless you & your easy to follow patterns! I loved making this afghan! It was so easy!!! I made 4 of them as gifts for the women in my family! THANKS!!! Great afghan! here is my problem. hdc"s! when I get to the end of the row I can NOT find the last hdc to turn on. I have become so frustrated because IF I miss the last hdc of the row it means I have I less stitch!!! My only thought is to be sure you make your turning chain loosely. How long since you got new glasses? I couldn't do all I do without my trifocals. I decided to use one multi colored yarn (I am leaving out the fringe since this is for a baby) And I am going through the back loop. For the third row, do i continue to go through the back loop or regular? It doesn't specify that it switches back to normal..but I am unsure. Thanks for anyones help! Work in the back loop throughout. thank you for the fast and speedy service! I've just found your site with your lovely work and access to your patterns. You're so kind to share. As I try them, I'll leave a comment. Thanks so much! Found your site and am loving it.Am making "Worlds Easiest Crochet Afghan".....Have lots of colors to use up and so far i am very excited on how its turning out.Thank you so much for making a fairly new crocheter very happy. Question: On row two it says: hdc in each stitch making sure to go into that first hdc? All my learn to crochet tutorials say for 2nd and all rows after you ch2, turn yo go into 2nd hdc to end making sure to hdc into the turn ch. My pattern doesn't count the ch 2 as a hdc. In my experience you get a nicer edge if you do it this way. Hi, I am a newbie at crochet. This is my first project and came accross ur easiest pattern :) But, I am finding it really difficult to follow the coded instruction :) Can you please elaborate and explian the 2 steps (Row_1 & Row_2_and_all_remaining_rows steps) in simple English. I do not understand what this means: Ch 2, hdc in blo (back loop only) of each hdc, being sure to go into first stitch. Crochet Pattern Central has a section on stitch instructions. Why would you choose to use a smaller hook than suggested? Do you crochet loosely? Hook size depends on the yarn and your personal tension. I is the size hook recommended for most worsted weight yarns. If you use a smaller hook you will end up with a stiffer afghan. Thanks for the world's easiest crochet afghan. Why it may not matter, I am a male and I enjoy crocheting. It is a release for me and give me a relaxing moment. Would you have any additional items for men? Thanks again, and may you have a BLESSED Day. Thanks for your comment. As far as other patterns there are many caps and fingerless mitts. Since you like afghans the Rectangle Granny is a good one. You can count if you want, this is just an easy way to make it as long as you like. Crochet a lot of chains and work as many as you like for the length and then cut off the remaining ones. You say to crochet as many as you want and "cut off the remaining ones (chains)" I'm assuming that when you're crocheting Row 1 back toward the beginning (where the tail is) and you decide you don't want it any longer you just CUT them off??? Won't it unravel? I have a real problem understanding this concept. Cut several chains away from your last half double crochet and undo the chains. Nope they won't unravel from that end of the chain. Use the tail as part of your fringe. Can you do this pattern on two colors I just wanted to know that is all. You can do it in as many or as few colors as you like. I have done it with scraps in many colors. What is "hdc?" I'm just learning. hdc is half double crochet. There are youtube videos showing how to make that stitch. the basic stitches but can't figure out how you start a chain with multiple strands.Can you help me with this. To work with multiple strands you just hold them together as one. This video shows how"
Just beautiful I can't wait to make this afghan. I have so many colors and family that would just love this for covers while watching TV. Tha k you so much.